The Kentucky Diversity Film Festival, which celebrates UK filmmakers is a three-day event, April 16-18 on campus. LEXINGTON, Ky. (April 15, 2019) — The University of Kentucky College of Communication and Information’s Diversity and Inclusion Committee is sponsoring the Kentucky Diversity Film Festival, which celebrates UK filmmakers in a three-day event, April 16-18 on campus. 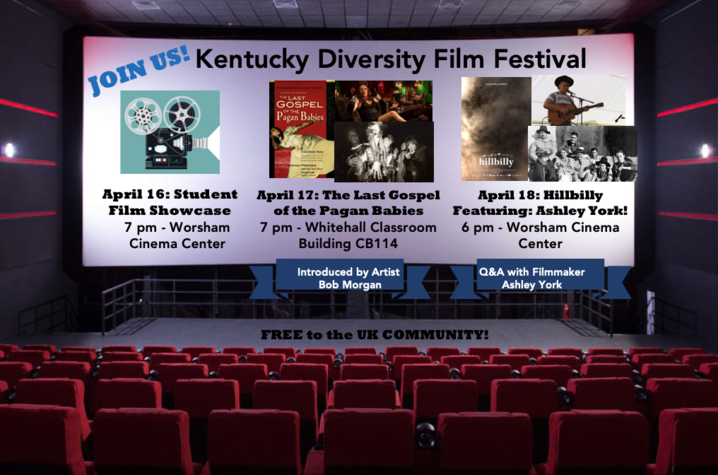 The Kentucky Diversity Film Festival kicks off 7 p.m. Tuesday, April 16, with a showcase of student film work in the new state-of-the art Worsham Cinema in the Gatton Student Center. The screening will be followed by an awards ceremony for the top student work. On Wednesday, April 17, see “The Last Gospel of the Pagan Babies,” directed by UK art history and film criticism alumna Jean Donahue. The film tells the story of Lexington’s vibrant gay cultural history and the artists, musicians, drag queens and celebrities who make up this exciting history. This special screening will be introduced by local artist Bob Morgan, who is featured in the film. The screening will begin 7 p.m., in 114 White Hall Classroom Building. This film festival will end with a showing of the award-winning documentary “Hillbilly,” directed by UK College of Communication and Information alumna Ashley York. The filmmaker will be in attendance for the screening and a Q&A after the film. The film explores depictions of Appalachia and reveals a rich and complex culture too often overlooked. The showing will start 6 p.m., in Worsham Cinema in the Gatton Student Center. Following this screening, a reception with York will take place at the Appalachian Center. “We want to showcase University of Kentucky students’ unique perspectives on diversity, and we’re showing two documentaries that explore unique aspects of the Commonwealth most haven’t seen before,” said Shannon Oltmann, diversity officer for the College of Communication and Information. The Kentucky Film Festival is sponsored by the UK College of Communication and Information and is free and open to the public.